A persistent lower back and shoulder pain has caused me considerable discomfort for some time. 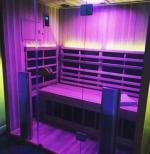 After using the infrared sauna for a month or so I realised both pains had vanished. For 20 years I have had difficulty sleeping, sometimes up to the toilet 5 times a night. Now I have 5-6 hours uninterrupted sleep every night. As someone who was accidentally exposed to neurotoxic chemicals resulting in peripheral, autonomic and central nervous systems neuropathy I was aware of the problems caused by detoxifying. When I started using the sauna I didn't sweat no matter what length of time I spent in it. However, gradually, over the three months I have been using it I have started to sweat sometimes profusely. Usually I have a pain in my stomach following a session. I relate this pain to detoxification. After one tablet of medicinal charcoal the pain vanishes almost immediately. Even if I sit immobile my legs below the knee develop pain. After a session in the sauna the pain increases but I live in hope that this is a healing of the nerve damage medical experts have advised me is irreversible. The main benefit I detect has been the improvement in my sleeping pattern and not having to visit the toilet every 30 minutes. This has given me a quality of life that has eluded me for 20 years!